Family Fishing in Kona Hawaii at its Best. The Dean Family from Eldorado Hills and Clear Lake California should purchase Lotto Tickets when they return home. 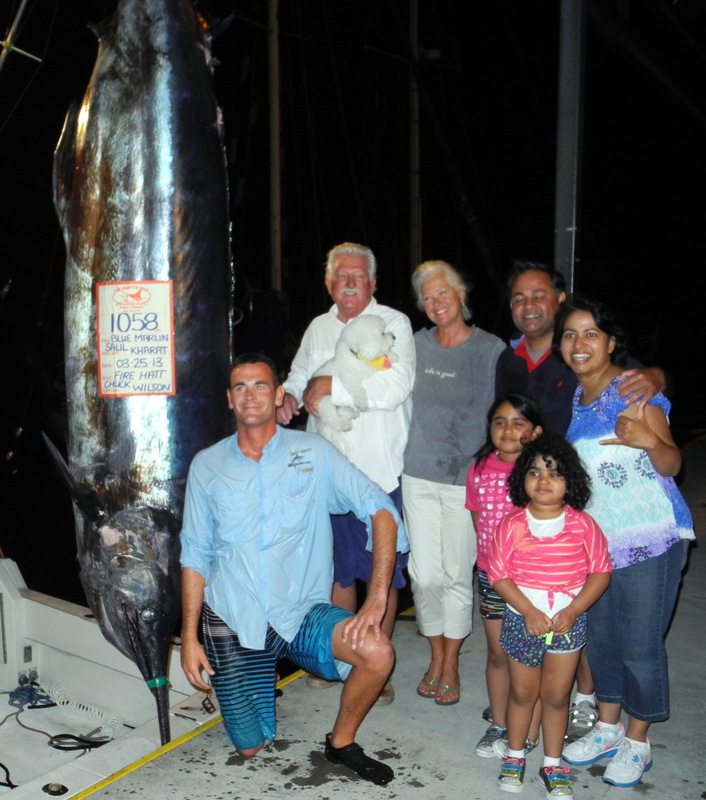 Thats the kind of luck they had fishing the beautiful silky calm waters of Kona. As we left the harbor we headed south. The day started with the first bite, a nice Mahi Mahi just fifteen minutes out of the harbor. Mike Dean is in the chair and although the fish came undone, it set the mood and pace for the rest of the day. About forty five minutes later as we are headed farther south, we have two lines come down, we are hooked up! A double on Ono! This time Mike Dean and Mike Dean Sr. are on the mark. They each landed their fish. Dinner for the family! Now just off Keahou Bay, we are patroling the area and twenty minutes later the stinger line comes down, and then wham, the long rigger line comes down. We are hooked up again! 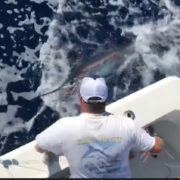 A double on what turned out to be Blue Marlin. Once again Mike and Mike Sr. were the anglers. 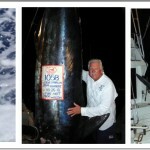 The blue marlin were estimated at about 100 lbs and 40 lbs. We are not done yet… as we were leaving the Captain Cook area we had anoher bite. 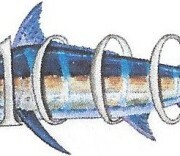 This one escaped, we think it was a Shortbill Spearfish. And finally, after a two hour lull in activity, the stinger line is ripped down again, we are hooked up! With Gina in the chair, she lands a Striped Marlin! We sucessfully release it and we are now on our way back to the harbor. 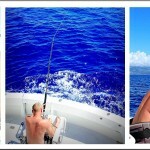 This is a banner day of fishing in Kona! 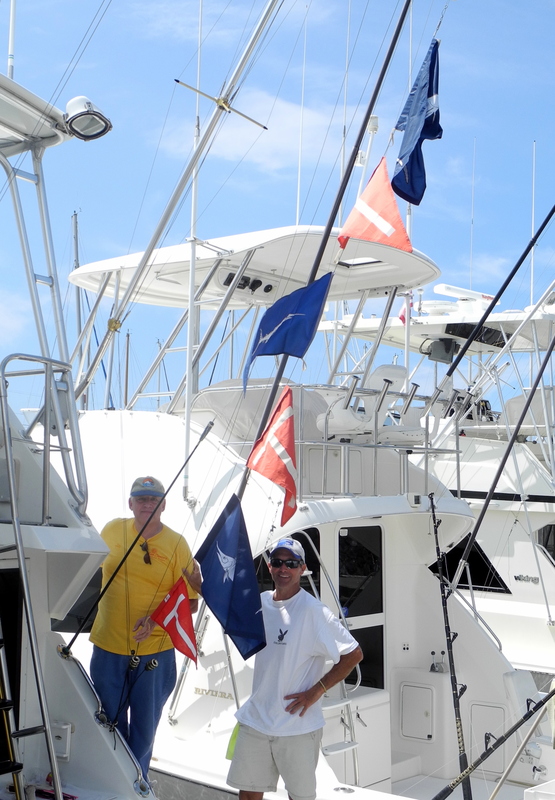 Going to need taller outriggers to hang this many flags. A good problem to have. Featured in the top photo is Fire Hatt First Mate Brett Lasenby with Gina Dean and her Shortbill Spearfish along with her husband Mike Dean and Mike Dean Sr. after landing their 20+ lb Onos. 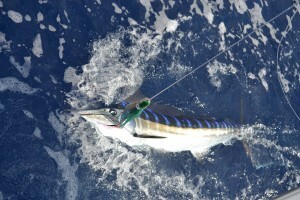 The photo above is one of the Marlin that were sucessfully released.